Q. 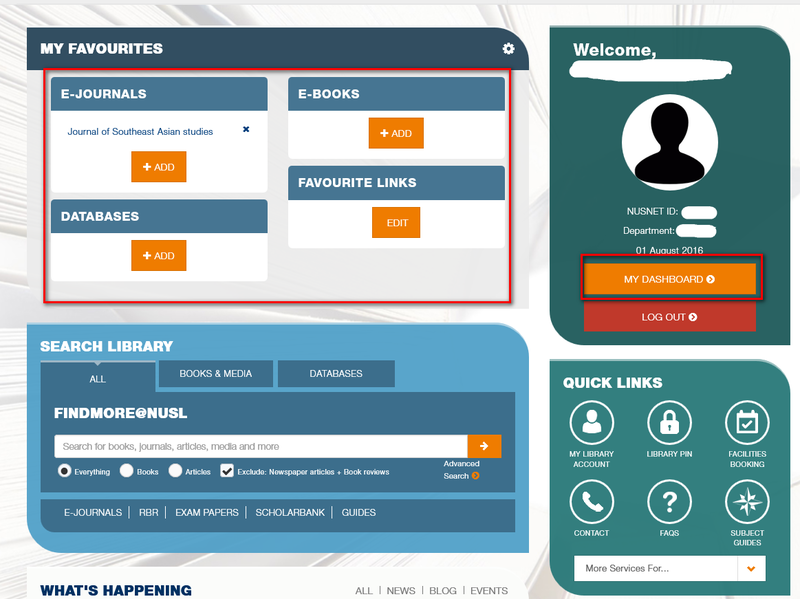 How do I login to the myportal on the Library Website? New incoming students , you will be considered a student of NUS only when you officially matriculate (pre-matriculation isn't sufficient). Upon official matriculation, it will take a few working days for the library record to be ported over. For new staff it may take some time for the login to be activated for the portal. Fortunately, it is not necessary to login to myportal first, if all you want to do is to access eresources, search for information or check your loan record. To search for information, you can start by using the All Tab which brings you to our Findmore service which allows you to search for books, articles and much more. You can also select the Books and Media tab which brings you to our library catalogue LINC to search for Books and Media items. To search for E-Journals and Databases, you can click on E-Journals and Databases tab before searching. Students & staff should also refer to this troubleshooting guide for the most common issues. 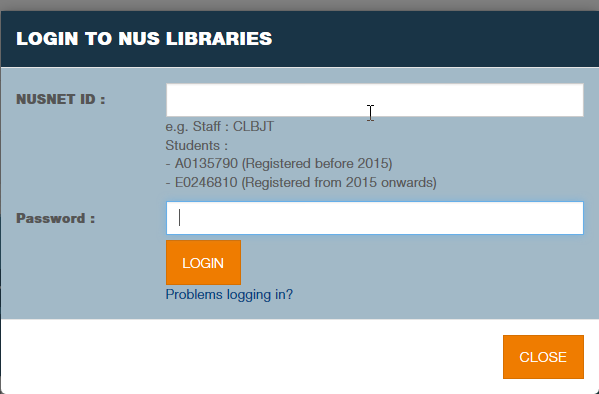 Only NUS students and staff can login to the library portal to request for specific library services (e.g Recommend book purchase, Intra-library loan) and also to customize their portal page. 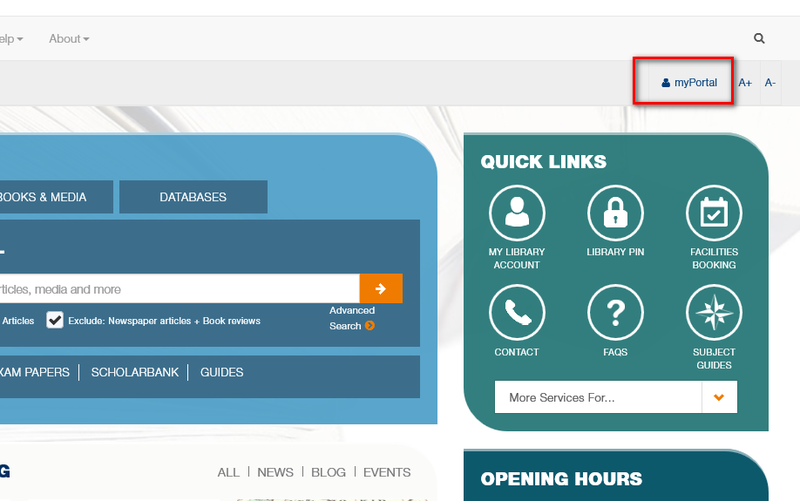 To login, at NUS Libraries homepage, click on the myPortal button located at the top right of the library homepage. For NUSNET ID please enter your NUSNET ID not Staff number or Matriculation number, without the domain. For Password please enter your NUSNET password (same as the password you used to access your NUS email & IVLE) not your PIN. Problems with your NUSNET Password? You may also be able to reset it via SMS. Once you have logged into myPortal, you can then add your favourite E-Journals, Book etc and you can also click on My Dashboard to have a quick overview of your library account. For more information about our new Library Portal, please visit this FAQ. 1. You are a student or staff of NUS. External personal members (including Alumni), corporate members, term card or term card holders (cards issued with ids starting with T) do not need to login to the portal. You can check your loan record here. 2. If you are new staff who recently joined us and have access to your NUS email, you probably can access eresources immediately, but your profile for the library portal (needed for other library services such as recommend book purchase) and loan account might not be setup yet. You can wait a few days or contact clbweb@nus.edu.sg with details of your problem and your staff card number and we will assist you with your issue. 3. If you used to be able to login but now can't, your NUSNET ID password might have expired as NUS Computer Centre requires you change your password every 180 days. 4. You are using Internet Explorer 7/8/9, Firefox, Chome or Safari . All other browsers are currently not officially supported and may have issues. 6. You have entered your NUSNET password correctly. If you have forgotten your NUSNET password please see the following instructions. How do I login to access eresources such as databases, ebooks, ejournals etc.? How do I log in to check my loan record (myLINC)? How do I login to access eresources such as databases, ebooks, ejournals etc.